Red Sox Collapse! What Were the Odds? Before being told by Han Solo to never tell him the odds, C-3P0 calculated that the possibility of successfully navigating an asteroid field was approximately 3,720 to 1. Perhaps if Chewbacca had done a Failure Mode and Effect Analysis on the hyperdrive, they wouldn’t have had to fly into an asteroid field. But I digress. You might think that Han defied the laws of probability by surviving his ordeal. You might think that nothing like that happens in real life. Well, you’d be wrong. Enter the 2011 Boston Red Sox. I'm going to use Minitab Statistical Software to compare the probability of Boston missing the playoffs to the probability of Han Solo successfully navigating an asteroid field. We all know what happened during the last game of the regular season. But forget all that for a moment. Forget the 7-0 lead the Yankees blew. Forget the fact that Boston was one strike away from winning their last game. Forget the fact that Tampa Bay hit a home run to eliminate the Red Sox from the playoffs 3 minutes after the Red Sox blew a 1 run lead in the bottom of the 9th. That was just icing on the probability cake. Boston's collapse started much earlier. On September 1st, Boston was 83-52, which corresponds to a winning percentage of 0.615. After that, they went a dismal 7-20 down the stretch, which matches the worst record they’ve ever had in the month of September. Had they won at least 8 of those last 27 games, they would have made the postseason, or at least forced a play in game. So we need to find the probability that Boston, given a winning percentage of 0.615, would have won at most 7 of their final 27 games. Minitab has probability distributions that can calculate the probability for us. We are going to use a binomial distribution because our data can be categorized into two events, either a success (win) or failure (loss). So we choose Calc > Probability Distributions > Binomial. We choose the cumulative probability because we want to know the probability of winning 7 or less games. We calculate less than 7 wins because winning any amount of games between 0 and 7 would have made the Red Sox miss the playoffs. At the beginning of September, Boston had 27 games remaining, so the number of trials is 27. The event probability is .615 because based on their previous 135 games, the Red Sox had won 61.5% of their games. Finally our input constant is 7, because we want to know the probability of winning 7 or less games. Note: I realize the Red Sox actual probability of winning each game varied from game to game. But in order to meet the assumption of the binomial distribution, I'm going to assume the probability was a constant 0.615. The calculation won't be exact, but it's going to be close enough. So without further ado, here are the results. The probability is 0.000189. So on September 1st, the odds of the Red Sox missing the playoffs were 5,291 to 1! Han Solo had a better chance of surviving the asteroid field than Boston had of missing the playoffs! Another way to look at it is the probability that they would have made the playoffs, which is 1 – 0.000189 = 0.9998. So 99.98% of the time, we would have expected the Red Sox to make the playoffs. Talk about beating the odds! Or rather, getting beat by the odds? Anyway, the next time something really improbable happens in a movie that makes you think "That would never happen in real life," think again. Sometimes the near impossible really does happen. The Red Sox are living proof. 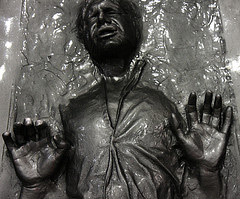 Photo "Han Solo in Carbonite" by Nathan Rupert, used under Creative Commons 2.0 license.